Tim Beattie looks at the years 1890/91 which turned out to be particularly difficult years for the Falmouth Harbour Commissioners. 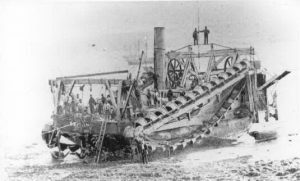 It appeared that the Arwenack suffered little damage in this escapade, but this was not the case in the harbour where an extensive list of sunk, damaged and beached vessels was recorded in the log. 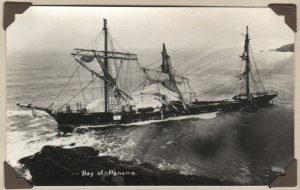 One notable absence from the list was the barque Bay of Panama the news of whose wreck on Nare Point off the Helford River that night, with the loss of the captain, his wife and 21 crew, did not reach Falmouth until some days later. To the Falmouth Harbour Commissioners the Great Blizzard must have appeared the last straw in an accumulation of troubles that threatened the harbour’s continuing existence as a trust port. On 9th December 1890, following the failure of the Commissioners to pay the damages and costs accumulated in a case, the High Court had issued an order placing Falmouth Harbour in the hands of a receiver – in this case Mr Corby the Falmouth Collector of Custom – who was empowered to receive any tolls, rates and income owing to the Commissioners. Mr Corby had already ordered them to pay over all cash in hand and they thus became effectively insolvent. On 16th December a letter from the Admiralty confirmed that it would be removing two channel marker buoys – considered by Trinity House to be essential for safe navigation in the harbour – and putting the responsibility for the considerable expense of replacing them on the Commission. On the 17th December the propeller fell off the Arwenack. On 30th January 1891 the Harbour Master was taken ill and, according to his doctor, his condition was ‘serious’ and would result in his being off work indefinitely. The great blizzard which followed three months later, while these issues remained unresolved, contributed a new set of costs accruing from damage to the Commissioners’ and police boats and a claim by the owner of the fishing boat Dove that the Arwenack had carried away and sunk her. How had matters come to such a pass? What is not mentioned here is that the very facility they showed for manoeuvring in tight spaces meant that steamers had a wider choice of destinations (independent of wind direction) and there was less need to stop at Falmouth ‘for orders’; as time went by the implications of the gradually increasing change over to steam was to profoundly affect the viability of Falmouth as a major port. FHC was what we would now call a not-for-profit organisation. The Falmouth Harbour Order dictated the organisations (Falmouth Borough and Parish, the Docks, Trinity House, ship owners, and the Earl of Kimberley) from which the 13 commissioners were to be drawn. They were unpaid but the work of the commission was undertaken by a small number of paid employees including the harbour master, two clerks, the five man crew of the steamer, the police sergeant and two constables. All others who obtained their living in or from the harbour like pilots or boatmen worked as independent contractors. It would seem, from this distance of time, to have been a remarkably streamlined and effective operation, encompassing a very wide range of activities – the management of shipping, maintenance of navigation and channel marks, dredging, policing, provision of port facilities, the welfare of mariners, immigration control and the collection of dues – with the minimum of administrative cost. To an extent this was the consequence of the constraints applied to their income, which came almost wholly from the dues paid by visiting ships and was fixed by the terms of their commission at 1/2d(c 0.2p) per registered ton. The Collector of Custom was paid a quarterly fee to collect the harbour dues on behalf of the Commission, an arrangement which made sense for both parties since the Collector was already required to visit ships on entry. Falmouth’s status as a port was, and remains, a marginal one. Although one of Britain’s largest natural harbours by area it could, in 1870, take few big ships without undergoing a substantial programme of dredging, which, as has been shown above, was only accomplished through obtaining a large loan. 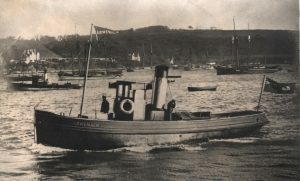 Falmouth’s land communications had improved immensely since the coming of the railway in 1863 but there was still little incentive for vessels whose final destination was London and the home counties to stop there. The famous instruction by owners of ocean going vessels to call at ‘Falmouth for orders’ was, with the installation of the Lloyd’s telegraph signalling station at the Lizard in 1856, still significant but no longer habitual. From the 1840s some of the main imports were food – corn in particular but also cattle from Spain – sucked in following the famine of 1847 and the subsequent recurrent food shortages in Cornwall. [*] Exports, apart from tin and copper ore, granite and pilchards were ‘inconsiderable’. To begin with the FHC was principally concerned with improving the harbour and regulating the movement and berthing of visiting ships. The Harbour Improvement Committee, a sub-committee of the Commission, met weekly to monitor the progress of dredging and receive reports from the harbour master and the police sergeant. The Commission was increasingly conscious of its declining revenue and made strenuous efforts to prevent ships avoiding harbour dues by mooring outside harbour limits or claiming that they had entered only to shelter or repair. The Committee also dealt with what we would now call HR matters and its deliberations on the duties and failings of the work force cast an interesting light on the civic values of the time. From the beginning the Commission adopted an appearance of scrooge-like parsimony in its dealings with employees and contractors. Uniforms and working clothes were provided for the harbour master, crew and the police, but there was a strict tendering process and money was saved by repairing rather than replacing where possible. Uniforms had to be returned when employees left, though, in one case at least, authority crumbled in the face of a determined widow. In February 1881 Mr Woolcock, the clerk to the Harbour Committee, was told to retrieve the work clothes of the recently deceased boatswain, William Barbery, from his widow. On reporting back that Mrs Barbery was reluctant to give up the Guernsey frock, oil coat and leggings worn by her late husband the committee pointed out that they were the property of the Commission and must be returned. Mr Woolcock went back to Mrs Barbery and demanded that she give up the clothes ‘but Mrs Barbery declined, saying she could not make up her mind to part with them’. In the face of such implacable resolution the Committee surrendered and ‘decided to let the matter drop’. [*] Mr Woolcock was instructed to buy an oil coat and leggings for the new boatswain (though not, one notices, a new Guernsey frock). 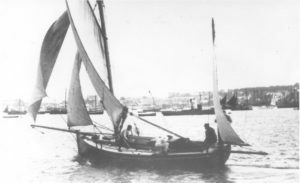 The licensed boatmen of Falmouth were integral to the functioning of the port. They operated two kinds of boat. The larger sailing quay punts (usually 25-30ft) would sail south of the Lizard to pick up incoming ships and offer an exclusive taxi and provisioning service while they were moored in harbour or in the bay, and smaller rowing boats would ferry crew members to and from the shore. They were also entitled by their licence to carry passengers to and from St Mawes, Flushing, Penryn, Mylor and the Docks. In any one year in the 1880s and 1890s there were about 120 boats and 85 boatmen licensed and it was the duty of the harbour master to inspect the boats and the police to collect the fees. They did, by way of a fudge in which Mr Mead agreed to license his boats while not yielding a jot his ancient right to run the ferry. The accident which resulted in severe damage to SS Rhosina while being docked happened on New Year’s Day 1884 but its financial consequences threw a darkening shadow over Falmouth Harbour Commissioners and their harbour master for the subsequent seven years. The Rhosina’s owners claimed that their ship, while under the direction of the harbour master, had grounded on its own anchor and suffered severe damage. They started an action for damages against FHC and Sherris in the high court in June 1884. Initially the FHC seemed confident that they had a good defence, a view supported by the QC they engaged to give an opinion on the case. Their hopes, however, were dashed, and the president of the Admiralty Division of the High Court gave his judgement on December 12, 1884 that the harbour master had been grossly negligent and that he and the Commission were liable for damages and costs. The court report suggests there was little doubt that Sherris’s action was grossly negligent. [*] It seems that Sherris had intended to assist a tug pull the ship round to starboard by dropping the starboard anchor and using its dredging effect. As the Trinity brethren pointed out this was a complex manoeuvre made more risky by the fact that the Rhosina was already ‘smelling the ground’ and likely to bring about what actually did happen, which was for the tug to pull the ship over its own anchor. [*] The defence arguments that Sherris was only on board as a friend of the master and not as harbour master was given short shrift by the judge, as was an attempt by the Commissioners to say that the grounding took place outside their jurisdiction. There is a hint of naivety in the Commission’s conduct of the case. At one point a report from the committee set up to consider the affair claimed that their defence had been considerably strengthened by a statement from a Mr Tresize that he had witnessed Sherris talking to the captain of the Rhosina in The Albion the night before and agreeing to go on board as ‘an act of friendship’. [*] It would not have gone unnoticed by anyone in the court that the night before the grounding was New Year’s Eve and that The Albion was a pub. The immediate consequence of the judgement was that the Commissioners and Sherris had to pay their own lawyers’ fees of £450 but they decided to go ahead with an appeal (FHCM 20/12/84 and 03/02/85) despite one of their two counsel advising against. Their appeal (the merit of which was indicated by the fact that the lords justices did not find it necessary to recall the Rhosina owners’ counsel) was dismissed on June 16 and the Commissioners found themselves liable to a total of damages and costs of around £2,000, which added to the existing loan for dredging the harbour gave a total outstanding debt of £9,800. An indication of the threat this posed to the solvency of Falmouth harbour may be shown by noting that the total income of FHC from tolls in the year 1884 – 5 was £1,672 and the outgoings (which included an interim payment to the lawyers) £2,132. They had no reserves and, as we shall see, other costs lurking over the horizon. In December 1887 the Admiralty wrote to the Commissioners that they intended to remove two buoys – the ‘Vilt’ and the ‘Eastern Narrows’ – which belonged to them, in six months’ time. This was an unexpected shock for the Commissioners since these buoys, along with the ‘Governor’ and ‘Lugo’ which were maintained by Trinity House, were key channel marks for shipping. 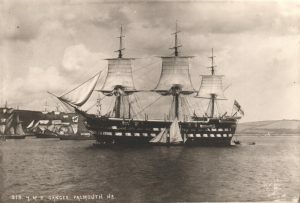 [*] The Admiralty’s view was that they were resolving an anomaly left over from the days before the Commission when Falmouth had a Queen’s Harbour Master and maintained the buoys for the convenience of HM ships, but since in 1887 the only HM ship based in Falmouth was the permanently moored Training Ship Ganges, the Admiralty had no further use for them. These two events cannot have come as a surprise to the Commissioners. The Admiralty first wrote warning of its intention to remove the buoys in 1888 and the Rhosina case had been rumbling on for six years but it must still have been something of a shock. The Board were, in a phrase suited to the circumstance, between a rock and a hard place and their parlous state was neatly summarised in a letter from the clerk of the Board to Trinity House in which he pointed out that the tolls levied by the Commissioners were limited by Order to 1/2d per ton register and that the revenue from this was fluctuating and decreasing. [*] The Public Loan Board debt, instalments on which were payable yearly with interest, was £7,280 and they owed about £2,000 damages to the owners of the Rhosina. It was ‘practically impossible’ for them to take over and maintain the buoys on top of the duties required of them under the Order. It had been suggested that even if the Board took ownership of the two buoys they were likely to be seized as assets by the Rhosina owners and sold. Since this was a less than a quarter of the sum originally claimed by the plaintiffs the Commissioners must have emitted a collective sigh of relief. [*] The money was raised through a loan from their bankers (Bolitho & Williams) guaranteed through a mortgage on the Arwenack. One sad footnote to this report is an entry in the original costs list which reads ‘Less Capt. Sherris’s effects realizing £49 – 16 – 7’. It seems likely that this contribution, probably a fraction of Sherris’s liability in the case, arose from a forced sale of his property. To add to his problems the Board ordered that Sherris must pay out of his salary any claim for additional service of the boatswain provided while he was off work and added that his contract would in future be subject to one month’s notice of termination. He carried on for eighteen months, retiring, at the age of 70, at the end of 1892. His house, 5 Clare Terrace, was sold in May 1893 and Sherris moved to London where he lived at ‘Pendennis’ in Catford until his death in 1899. His will records that he left everything, amounting to £65, to his wife. The matter of the Admiralty buoys was resolved in a sudden flurry of activity on the part of the Board. Robert Fox and Thomas Webber went to London on 5th March 1891 and met Lord Northbrook who gave them ‘excellent advice’ and a letter to the secretary of Trinity House. [*] The secretary looked closely at the case and asked them to meet the Elder Brethren at their next meeting. They put their case to the Deputy Master, Sir Sydney Webb, who finally informed them that they could leave the matter in his hands and that Trinity House would request the Admiralty not to remove the buoys. [*] And so it was. Trinity House effectively acquired the buoys as their property and maintain them to this day. Falmouth Harbour has experienced cycles of (relative) boom and depression from that time until now, but the underlying pattern is of decline. In 1869 (the year before FHC was formed) Falmouth pilots earned a total of £14,022 in fees. By 1900 the total was £4,793. In 2017 FHC reported a deficit of £140,000 on its current account and was forced to sell one of its pilot boats; it predicted a bleak future in which revenue from the oil bunkering service continued to decline from the highs experienced ten years before. Ship repair has continued to profit from Admiralty contracts for its RFAs but these large supply ships deny berths to cruise liners and other vessels. It is a situation that could have been (indeed was) predicted by Robert Fox in the 1870s. Falmouth has neither the hinterland nor the communications to support a large seaborne trade and, since the removal of the packet service, has always had to rely on precarious distinctive services, such as ‘Falmouth for Orders’, ship-repair and bunkering, to survive. When the harbour was being dredged in the 1870s to allow for the berthing of the larger ships that steam power was encouraging the dredging engineer reported that progress was being slowed by particularly difficult conditions in which the ‘Surface of ground, and for a depth of 4ft or 5ft is very hard and consists of pure coral gravel’. [*] The same coral gravel (or marl) has proved difficult now, as FHC attempts to obtain permission to dredge this environmentally sensitive material in order to pave the way for Falmouth’s next saving expedient – the burgeoning cruise ship business whose vast vessels need ever deeper channels and berthing spaces. The chief sources for this article are the Falmouth Harbour records kept in the Bartlett Maritime Research Centre at the National Maritime Museum Cornwall. These consist of the minute books of the Falmouth Harbour Commissioners starting on 05/09/1870, the Harbour Improvement Committee (later the Harbour Committee) starting on 19/12/1870, the journals of the Harbourmaster and the police and the ledgers and toll books of the harbour and docks. Further evidence has been garnered from newspaper reports in, among others, the West Briton, Royal Cornwall Gazette and Western Morning News. Although there are letter books containing mail sent by the Board I have been unable to unearth any incoming correspondence and this, particularly in the case of the sudden and inexplicable volte-face perpetrated by the Admiralty over the responsibility for harbour buoys, leaves some annoying gaps in the record. My thanks to Tony Pawlyn, Linda Bachelor and Lloyd Pond for providing and pointing me towards a number of sources of information helpful to my research.